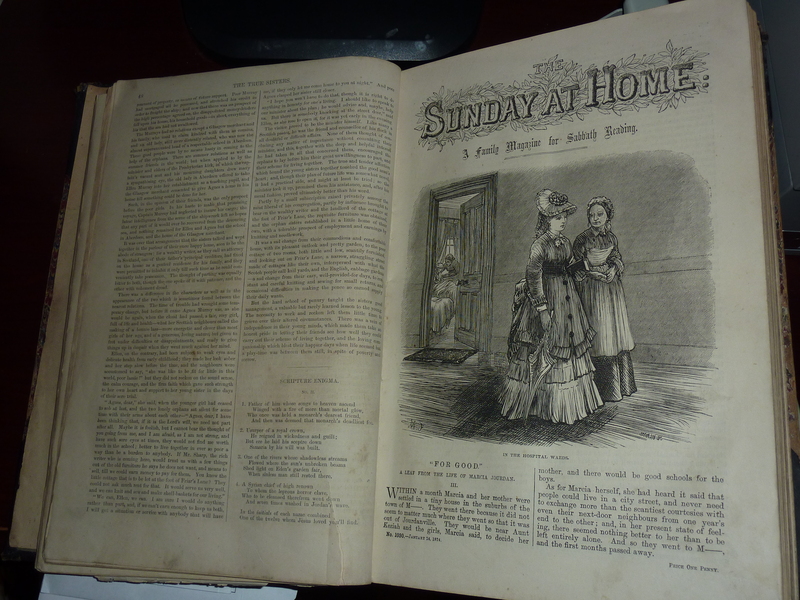 The Sunday at Home (1035, February 28, 1874). Click to enlarge. Both of the following Scripture Exercises are from The Sunday at Home: A Family Magazine for Sabbath Reading, (issue no. 1035—February 28, 1874). In the comments thread, give me a good, solid paragraph on why you don’t have time to look up the examples these exercises request. 😉 Or just click “Like” to let me know you’re reading these, and want to see more, comments or no comments. Thanks! The answers will be posted next week. There is an emphatic way of speaking observable in Scripture, not altogether unknown to our own languages. When anything may be done from two motives, or when two effects are mentioned as proceeding from one cause, if one of them is of much less importance than the other, it is spoken of as though it did not exist. Thus when Jehoshaphat urges his magistrates to judge justly, he says, “For ye judge not for man, but for Jehovah” (2 Chron. 14:6); whereas, a righteous judge should be actuated by the desire of doing his duty towards both. When there is a comparison between two degrees of liking or love, the lesser degree is sometimes called “hate.” Thus Jacob had two wives, one of whom is said in one place to be “hated,” but in another to be “loved less.” In Deut. 21 is found a similar case. Young students of Scripture may exercise their powers of observation in finding some examples of this usage in Scripture language. The word “hate” also often means, “act as though you hated.” There is occasionally a similar use of the word “love.” Give some examples. David undertakes to explain what is the nature and the advantages of the fear of the Lord in Psalm 34:11, etc. Proverbs 13 also gives a shorter definition. Give some other examples. From now on, I won’t update the original post itself, but will post the answers separately and link back to the original post, as I’m doing today. That way, the answers won’t be immediately given away, but will be accessible through the trackback link in the comments thread. Always remember to at least “Like” these posts, if you don’t have time to put any guesses in the comments thread. I would appreciate it, and it would give me enough steam to keep posting these. My Site Stats and encouragement from behind the scenes tell me people are watching for these challenging quizzes; likewise, I’m watching for some personal interaction in the comments thread. If you’ve taken the time to read the questions, take an extra minute to post a guess, say hi, or just click “Like.” Thanks! With apologies for the delay in posting these quizzes, here is Scripture Enigma, No. 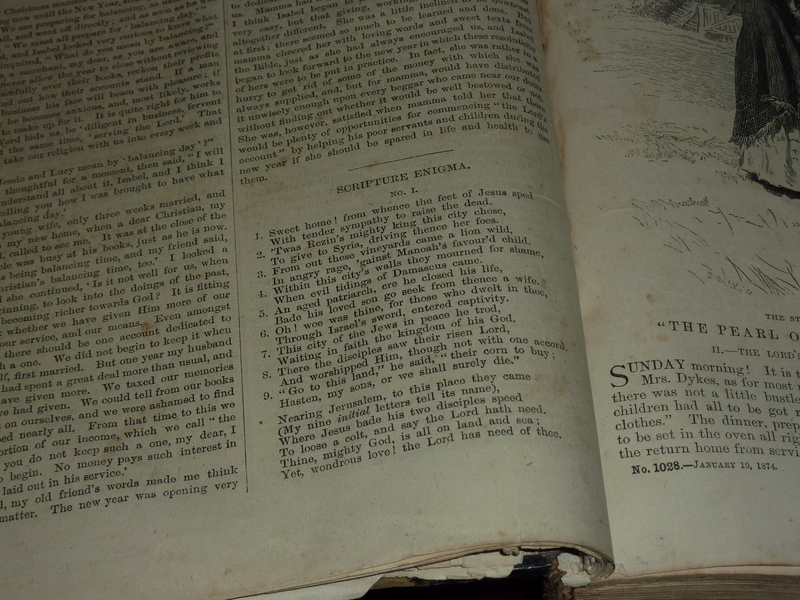 4, from the February 14, 1874 (issue 1033) of The Sunday at Home: A Family Magazine for Sabbath Reading. Post any answers you can figure out, or even wild guesses, in the comments thread. Answers will be posted next Friday. Have a nice weekend, and an edifying Lord’s Day. An element sometimes used as a symbol of the Holy Spirit. The place to which he belonged who, together with Nicodemus, buried Jesus. A disciple whom Peter raised from the dead. A river by the banks of which Daniel saw a vision. A prophetess who endeavoured to intimidate Nehemiah when engaged in rebuilding the wall of Jerusalem. One who stirred up a revolt against Paul at Ephesus. One who, for his godly zeal, had conferred pon him and his posterity an everlasting priesthood. A king of Syria who drove the Jews from Elath. That which it is good for a man to bear in his youth. The initials of the above words form a solemn admonition given by our Saviour. Don’t you just love quizzes that give away the answers to earlier questions in the later ones? 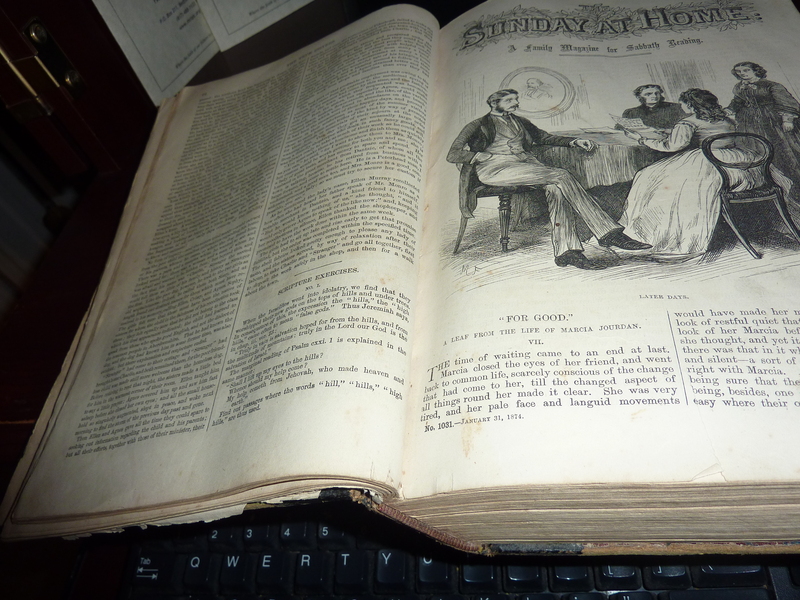 Surely you can at least figure some of these out this way, if you aren’t going to sit down with your Bible and find all of the answers to the following questions from The Sunday at Home: A Family Magazine for Sabbath Reading (issue 1032, February 7, 1874). By whom was the second king of Israel selected? Name his father, tribe and birthplace. What was his occupation when chosen to be king? Mention any passages in the Psalms which refer to this. Have we any clue to his character as a shepherd? Where was he anointed? By whom? What change was seen in him from that time? What brought him first to court? How was he regarded by King Saul? What led him to give up his pastoral work for that of a soldier? How did he at this time show his simple trust in God? We have seen how David became the object of Saul’s envy. Did any of his own family show a similar feeling toward him? David had to be trained for the great work which God had for him to do, and he needed trial to strengthen his character. Can you find any texts which speak of the blessing of affliction, even in early life? For many years from this time, David was an exile and a fugitive. Find the references to the following places where he took shelter—Ramah, Nob, Gath, Adullam, the forest of Hareth, Keilah, the wilderness of Ziph, Engedi, the wilderness of Paran, Gath (a second time), Ziklag. How did he meanwhile provide for the safety of his parents? Can you find anything in the history of his ancestors which may select a possible reason for selecting that country? Mention some occasions on which he showed want of faith, and show how in each case he brought himself into difficulties. Which Psalms appear to refer to this part of David’s life? The following is from The Sunday at Home: A Family Magazine for Sabbath Reading (No. 1030–January 24, 1874). Find out passages where the words, “hill,” “hills,” “high hills,” are thus used. Other “Head Knowledge Helpers” like this one are categorized under the heading “The Sunday at Home“. Here’s Scripture Enigma, No. 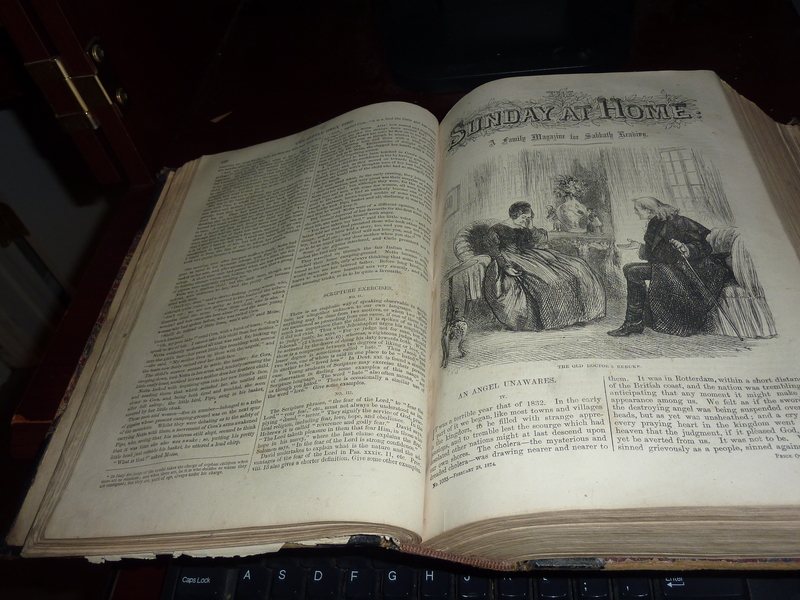 II from the January 17, 1874 edition of The Sunday at Home: A Family Magazine for Sabbath Reading. and then was deemed that monarch’s deadliest foe. Samaria by his will was built. When sinless man still rested there. And seven times washed in Jordan’s wave. One of the twelve whom Jesus loved you’ll find. What reasons did the people of Israel assign for their wish to be governed by kings? How had they been previously governed? Where do you find that God had anticipated this desire, and what directions had He given with regard to it? By whom was the first king of Israel selected? Mention his name—his father—his tribe. By who was he anointed? And where? On what errand was he engaged at the time? What change came over him from that time? Where was he first proclaimed king? How did God show his displeasure with the people at the time? What indications can you find of filial obedience, modesty, and courage in the early history of Saul? For what reasons did God take the kingdom from him? When was this first told him, and by whom? How did the tidings affect Samuel? Give other passages from God’s Word, which teach us that outward observances of religion have no value with God unless accompanied by a life of obedience. Saul professed repentance—but what showed that his repentance was not sincere? From this time we see a great change in Saul. What affliction came upon him? How did he obtain relief? Have we any indications of a loss of personal courage? What aroused his jealousy of David? From this time Saul’s heart was set on David’s death. Mention any occasions on which David narrowly escaped his enemy, and how he was delivered. Mention any indications of relenting. On what two occasions was Saul’s life spared when he was in David’s power? What proofs have we of the tender love between David and Jonathan, Saul’s son? Show that its foundation was laid in true religion. Saul was left by God. To whom then did he seek for help? And with what consequences? What was his end? Which of his sons died with him? By whom, and where were they buried? How long did Saul reign? What became of the other sons of Saul? See his self-justification, 1 Sam. 15:15. His excuses, 5:21. When at last confession was extorted from him, he feard losing the respect of the people, not the favour of God, 5:30. 1 Sam. 18:8, 9, 15, 29. Prov. 14:30; 27:4; S. Song 8:6; Gal. 5:21; Jas. 3:14, 16. 1 Sam. 19:6; 24:16-22; 26:21-25. 1 Sam. 18: 1-4; 19:2; 20:3, 11-17, 34; 23:16-18; 2 Sam. 1:26. 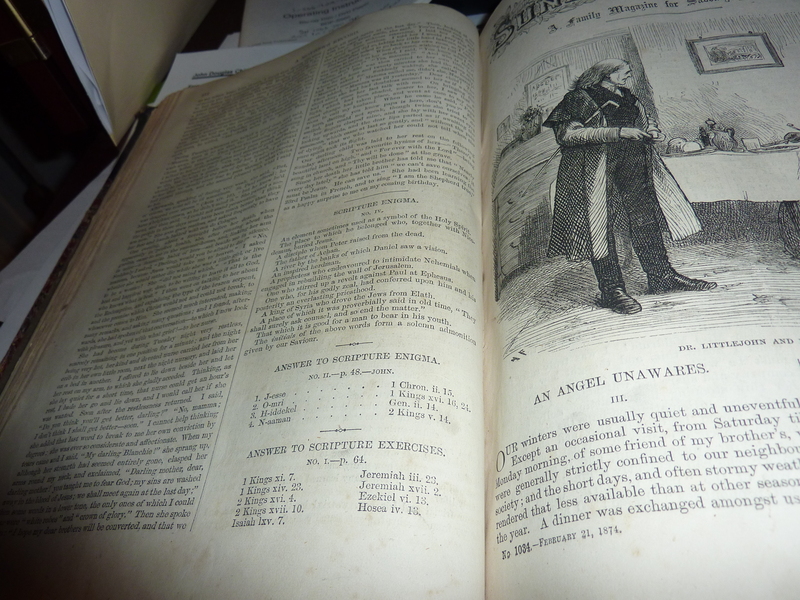 I have in my possession an antiquarian volume which contains all the issues of a weekly religious magazine from England published in the year 1874. 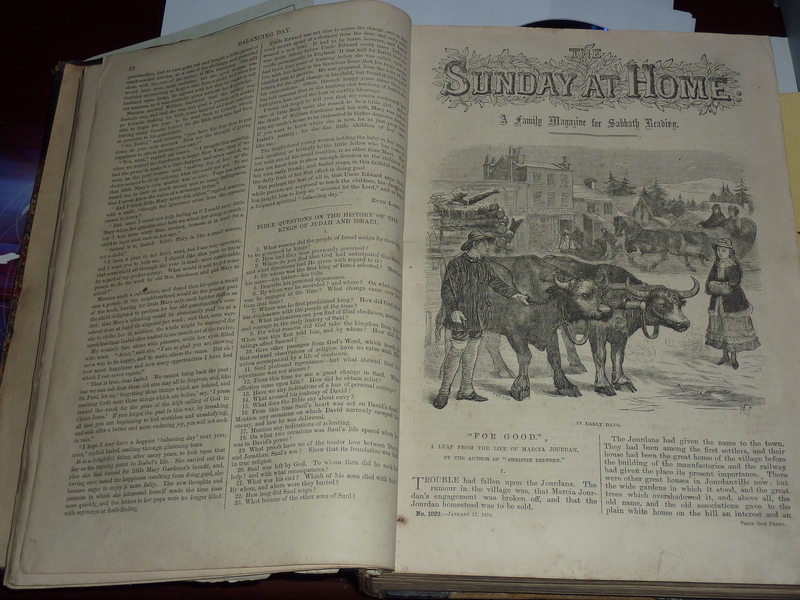 The book and magazine are called The Sunday at Home: A Family Magazine for Sabbath Reading. Each issue includes articles on various topics related to the Christian faith, family devotionals, even serial novels. But one of the most intriguing features of this magazine is a little quiz called “Scripture Enigma.” These are often really, really tough! In the light of the recent reports of very poor biblical literacy on the part of evangelicals, perhaps it would be appropriate to challenge you to crack open your Bibles to track down the solutions to some of these riddles. I’m planning to post one each week in the hopes that some of you will take up the challenge and post your answers in the comments thread. In some of the quizzes, the first letter of each answer will spell a word that solves the riddle that comes after the numbered list of other riddles. This is the case in this week’s “Enigma.” Other weeks will feature other sorts of biblical mind-teasers. I’ll update these posts with the correct answers the following week, and then I’ll post the next quiz. So, without further ado, grab your Bibles! with tender sympathy to raise the dead. To give to Syria, driving thence her foes. In angry rage, ‘gainst Manoah’s favour’d child. When evil tidings of Damascus came. Bade his loved son go seek from thence a wife. Through Israel’s sword, entered captivity. Waiting in faith the kingdom of his God. and worshipped him, though not with one accord. To loose a colt, and say the Lord hath need. Yet, wondrous love! the Lord has need of thee.